Metformin is a drug that is used to increase the body's sensitivity to insulin. While normally its usage is limited to diabetes, recent research has implicated that it may be beneficial for enhancement purposes in people that do not have diabetes. A 15-year long observational study showed that metformin was useful for preventing metabolic deficits related to diabetes (resulted in lower BMI and and Hemoglobin A1c values)1, and a number of studies have shown that metformin was useful for prolonging lifespan. These findings are prominent and the usage of metformin people that do not have diabetes should be given more emphasis in research and perhaps become a standard of care in the future. In most medical circles, metformin is reserved for people that have diabetes. However, there is an emerging body of scientific research that shows evidence for the efficacy of metformin for improving longevity and improving insulin sensitivity, even if the body is in a healthy state. A very interesting study was published in 2015 on a 15-year intervention period for 2,776 people at risk (but do not have diabetes). Participants that were identified as having a moderate risk for developing diabetes were given metformin as a preventative measure. This group of participants was matched by a participant group that got placebo treatment, as well as a group that was instructed to make lifestyle modifications (exercise and diet) for prevention purpose. It was found that over a long period of 15 years after starting treatments, the incidence of diabetes in the people that took metformin was dramatically lower than in people that had placebo treatment (60% incidence in placebo, 52% in metformin group, 50% in lifestyle intervention group).1The fact that the metformin group exhibited very similar incidence rates of diabetes 15 years into the intervention period, was promising and should motivate future research on possible usages of metformin for enhancement purposes such as weight loss, longevity, or prevention of cognitive disease (cognitive decline and memory decline are linked to diabetes). In a 15-year long study, subjects who were at risk of diabetes, but who did not have diabetes, resulted in dramatically lower rates of diabetes at the end of the 15 years (similar rates as if patients just did lifestyle modifications. In a study in 64 mice, it was found that supplementation of diet with metformin was effective in prolonging lifespan in mice by over 30%. The long term effects of metformin should be carefully analyzed before metformin usage is proposed as a supplement for purposes of human enhancement. Regarding longevity, there are studies in mice but the metformin effects on longevity have not been carefully studied in humans. It's tempting, but we don't recommend doing it at this time. There are almost no studies that have probed deeply into the long-term side effects of metformin. Trying metformin for the purpose of enhancement may work in theory (and even in practice) if you are not diabetic, but there may be long-term adverse effects that may not arise until somebody is several months or years into their usage regimen. Diabetes Prevention Program Research Group. (2015). 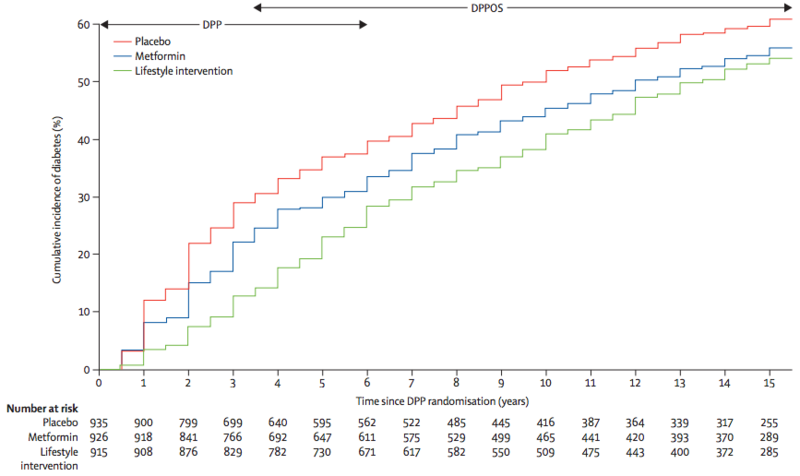 Long-term effects of lifestyle intervention or metformin on diabetes development and microvascular complications over 15-year follow-up: the Diabetes Prevention Program Outcomes Study. The Lancet Diabetes & Endocrinology, 3(11), 866-875. Martin-Montalvo, A., Mercken, E. M., Mitchell, S. J., Palacios, H. H., Mote, P. L., Scheibye-Knudsen, M., ... & Schwab, M. (2013). Metformin improves healthspan and lifespan in mice. Nature communications, 4. Riera, C. E., & Dillin, A. (2015). Can aging be'drugged'?. Nature medicine, 21(12), 1400-1405. Barzilai, N., Crandall, J. P., Kritchevsky, S. B., & Espeland, M. A. (2016). Metformin as a tool to target aging. Cell Metabolism, 23(6), 1060-1065. Kaeberlein, M., Rabinovitch, P. S., & Martin, G. M. (2015). Healthy aging: the ultimate preventative medicine. Science, 350(6265), 1191-1193. Check, H. E. (2015). Anti-ageing pill pushed as bona fide drug. Nature, 522(7556), 265.